Spending everyday with the tools you need to be happier and live a more positive life can be one of the most empowering things you will ever do. Think about smiling more, yelling less, reducing stress, and finding happiness in your life. Sounds fantastic doesn’t it? Being able to turn situations that would normally send you in a tailspin into something easier to manage and sometimes something to look forward to is an artform you can master and I have some simple tricks you can start implementing now to get you on the right path to a positive life. I’m giving you 50 Action Steps you can start using today to help you live a more positive life. You can pick a few of them, or challenge yourself to do all of them, but no matter what, if you start taking action and making some of these positive steps routine in your life you’ll find you smile more, you’ll be happier and you’ll be living an all around positive life. Want to start living a more positive life now? Become a VIP member and you’ll receive a free gift of the mini eBook, 50 Action Steps to a Positive Life. 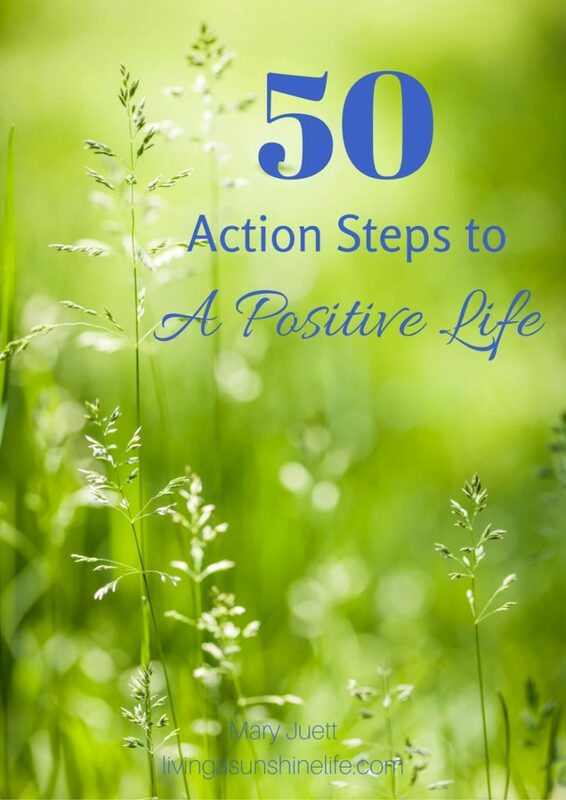 50 Action Steps to a Positive Life is a thank you gift for joining the Living a Sunshine Life VIP list where you’ll receive weekly updates with blog posts to inspire you to live a more positive life. Join the VIP list below!